The 'first ever' marathon of laughing. 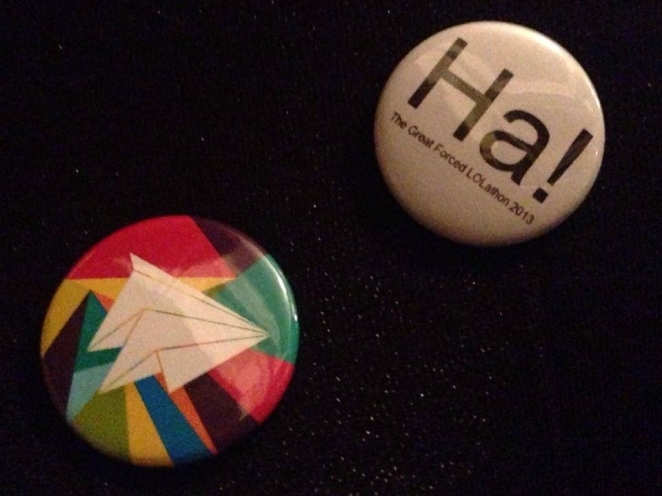 The Great Forced LOLathon was a marathon of laughing out loud for 26.2 minutes. Held in the grand surroundings of Newcastle’s Mining Institute, it was a demanding, challenging, and – for most people – a unifying experience. Some even said it was fun. Finishing a LOLathon is an accomplishment less than 0.001% of people in the world can say they have achieved. The 50 people who can, joined us after following a demanding training programme – details of which can be found here – and managed to fill the room with peels, whoops and thigh slaps. The LOLathon was filmed by Sky Tyne & Wear, which closed down before it could be broadcast. (We take no responsibility for this). Sadly therefore there is no video of the event. But it sounded a bit like this. The idea sprung from the mind of artist Kate Stobbart, one of the brilliant participants from the 2009’s Tours of People’s Homes.